The KitchenAid Professional 5 Plus KV25G0X[WW] is part of the Mixer test program at Consumer Reports. In our lab tests, Mixer models like the Professional 5 Plus KV25G0X[WW] are rated on multiple criteria, such as those listed below. Bowl size: Manufacturer's claimed bowl volume, to the next highest half-quart. Claimed speeds: Manufacturer's claimed speeds. Style Style Tilt-head style- the head is lifted up and down into the bowl. Bowl-lift-the bowl lifts up to the beaters and head of the mixer. Open bowl- the beaters are placed on a spindle in the center of the bowl. Single beater style Single beater style A single beater, whisk, or dough hook rotates in one direction and moves around the bowl in the other direction. 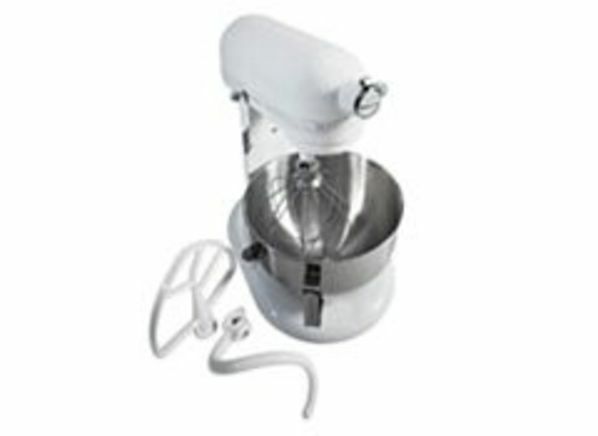 This is in contrast to two-beater style mixers, with beaters similar to those of hand mixers, with a rotating bowl. Bowl handle Bowl handle Whether the bowl has a handle. Whisk Whisk For mixtures that need air incorporated, such as meringues (egg whites), whipped cream, mousse, and some types of cakes and custards. Dough hooks Dough hooks Use for kneading yeast bread doughs. Takes power attachments Takes power attachments Many models offer optional accessories such as food grinders, or pasta makers. These attach to a power port on the unit. Detachable hand mixer Detachable hand mixer Mixer "head" comes apart from the stand to be used as a hand mixer. Typically found only on light-duty stand mixers. Two loaf capable Two loaf capable Our Kneading score considers performance making one-loaf of bread. We attempted to make two-loaves if appropriate for the mixer, and list those that handled the task with little or no difficulty. Dishwasher-safe Dishwasher-safe Dishwasher safe is based on the manufacturers' information; many recommend washing by hand. Warranty (yrs.) Warranty (yrs.) The length of the warranty, in years.